Mathison, Keith A. 1999. Postmillenialism. An Eschatology of Hope. Philipsburg, NJ: P&R Publishing. (ISBN 0-87552-389-7) - Good one volume over-view of Postmillennialism. Written by a proponent. Bock, Darrell. 1999. Three Views of the Millennium and Beyond. Grand Rapids, MI: Zondervan Publishing. Gentry, Kenneth. 1992. 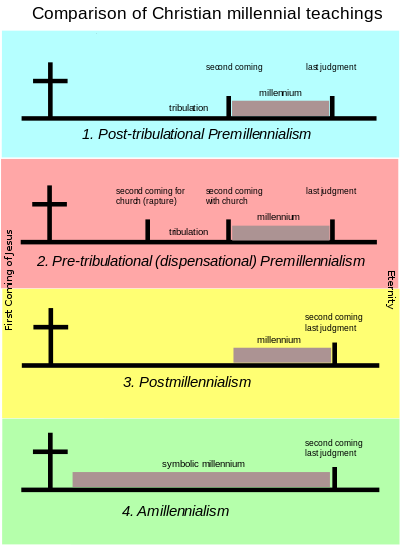 He Shall Have Dominion: A Postmillennial Eschatology. Tyler, Tx: Institute For Christian Economics. North, Gary. 1990. Millennialism and Social Theory. Tyler, Tx: Institute For Christian Economics.